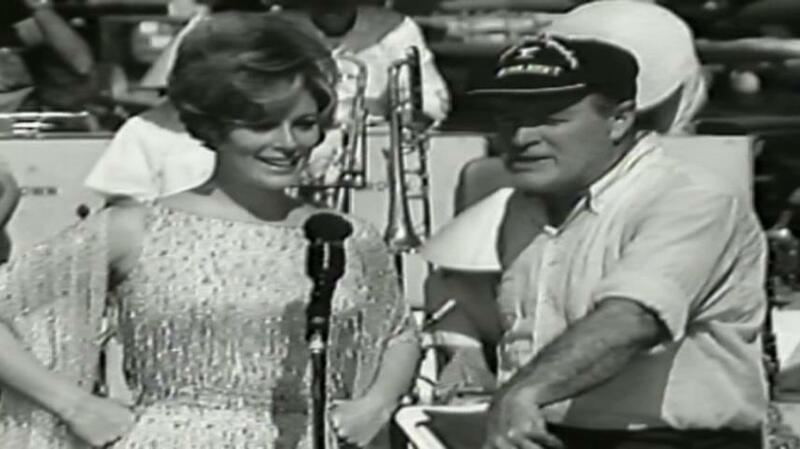 Time-Life brings us another collection of Bob Hope specials where he and a number of guests visit the military overseas to brighten their time there during the days surrounding Christmas. A number of these have been released on DVD before from R2 Entertainment and Time-Life has been packaging their discs in a number of different configurations- judging from the menus on the three discs in this set they appear to have been originally made for larger sets. Hopefully I'll be able to outline the contents here for those seeking out these shows but not wanting to pick up redundant material. The six shows here range from 1962 to 1990, all done during the week of Christmas and shown on NBC that January as belated "Christmas Specials" but still managing to be amongst the year's highest rated programs. The format remains the same throughout- Bob narrates to the audience as we first see him and his crew leave California and then stop at US military bases in the Asia-Pacific region, doing at least one show for the troops each day and then heading off to their next destination. Each show starts out with Bob greeting the large gatherings with quips about the location, political climate, current popular culture and a few good-natured digs at himself before introducing the guests who've come along with him. The specials all end with a group singing of "Silent Night" followed by footage of Bob visiting wounded hospitalized soldiers as he tells us about what they've accomplished along with hopes for a more peaceful future. Disc 1 begins with the most recent performance, "Christmas Cheer in Saudi Arabia" broadcast in January 1991 during Operation Desert Shield. The crowd cheers as Bob suggests that Saddam Hussein get his own star on the Hollywood Walk of Fame- "So we can spit on it- or something else!" The monologue truly dates itself when he takes a jab at Milli Vanilli, the Grammy-winning pop duo exposed as a fraud at the end of 1990. 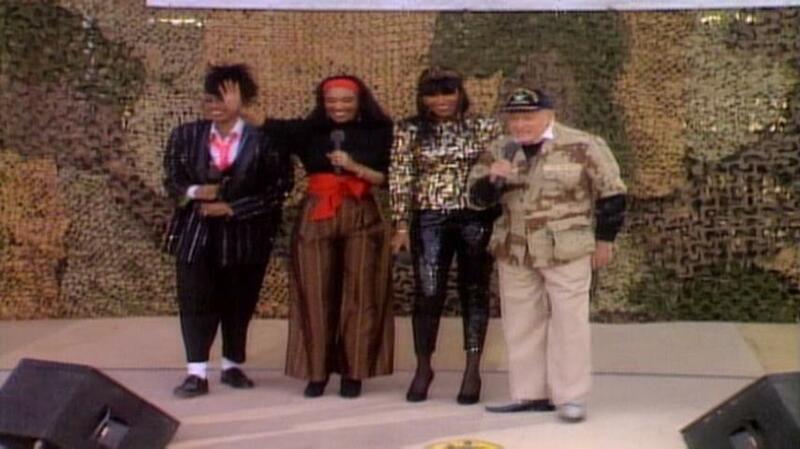 Long-time guest, baseball star Johnny Bench, joins Bob for a baseball-related comedy routine, Marie Osmond brings a soldier up on stage for a song (another frequent occurrence in these shows) and the Pointer Sisters perform their enduring hit "I'm So Excited." I was pretty excited for that in particular, though quite let down as the sound on this special is presented here in mono when it was originally in stereo on TV. We then go back to 1969 with "Around the World With the USO" as the crew makes stops in Vietnam, Korea, Japan and Thailand. Ann-Margret is the highlight of this one as she sings "Dancing in the Street," in one show a skydiver surprises the audience by literally dropping into the show, and song-and-dance troupe join Bob singing "Perfect Gentleman." Billed as a "Bonus Feature" is the most recent special in the set from August 1995- "Memories of World War II" with Bob and his wife Dolores recounting how the tradition of entertaining US troops for the holidays got started as they pore over scrapbooks. In the days of radio, Hope started out recording special shows and shipping them out on records for them to hear, then deciding they deserved a bit more than that and actually paying them a visit in person. Several film clips, audio and still photos from the era are shown including routines with Bing Crosby and future Brady Bunch and Gilligan's Island creator Sherwood Schwartz. Disc two features two "Christmas Specials"- the first from 1965 with guests including Anita Bryant and Jill St. John. Bob casually mentions that they nearly escaped a hotel bombing in Vietnam. Unfortunately the odd running time of this and the following special from 1963 suggest that a few bits were cut out likely because of rights clearances. The second special also features Anita Bryant and includes a rather bizarre skit with the two of them as they portray a beatnik couple, and a very politically incorrect sketch with Lana Turner where Bob plays a stereotypical "Mongolian Fruitcake." 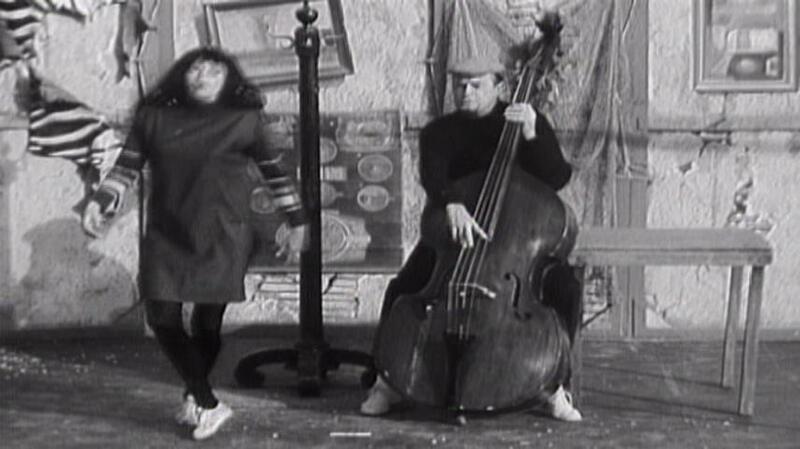 Turner later does a bossa nova performance where the issues of clearances rear their ugly heads again as the audio is replaced with a stereo track of replacement music and fake applause. Thankfully an energetic performance by Janis Paige of "Ballin' the Jack" survives intact. Disc 3 jumps ahead to the later years of the Vietnam war. The first "Christmas Special" done in 1971 includes another baseball star Vida Blue who joins Bob singing "You Gotta Have Heart" where they trade comic insults in between verses. Roller-skating "Blue Streaks" perform to more replaced generic music and applause, and the closing "Silent Night" is led by Jan Daley, who later appeared in Sanyo's TV commercials in the latter half of the decade. The following year's special (which retains NBC's notice that the usual "Mystery Movie" won't be seen tonight) brings in Redd Foxx where he and Bob do a Navy sketch and "The American Beauties," winners of various "Miss State" pageants appear onstage mostly for the male audience to ogle. All specials except for the first and "Memories of World War II" were shot on 16mm film, the two on the second disc in black and white. The 1965 special has the poorest quality, from an analog tape source with a VHS-level picture though it's still certainly watchable. The color specials appear to be from the network videotape masters, judging from the analog noise visible in the reds. The film elements themselves appear a bit beat-up at times but that isn't due to age; they looked just like that when first broadcast. The 1991 special is naturally clear being shot on videotape. As I've found with most Time-Life DVD releases, the compression is just a bit sub-par showing artifacts occasionally. As mentioned before, the 1991 special was originally broadcast in stereo as that technology had been well-established by then, but oddly presented in mono here. "Memories of World War II" at least retains its stereo mix even though that doesn't help the mostly archival material much. The rest are adequate, about the level of quality you'd expect from 16mm film- although the sudden jumps in a few parts to a stereo track of replacement music and fake applause is quite distracting. All shows have traditional closed-captions, which a few players lacking analog outputs won't be able to display. 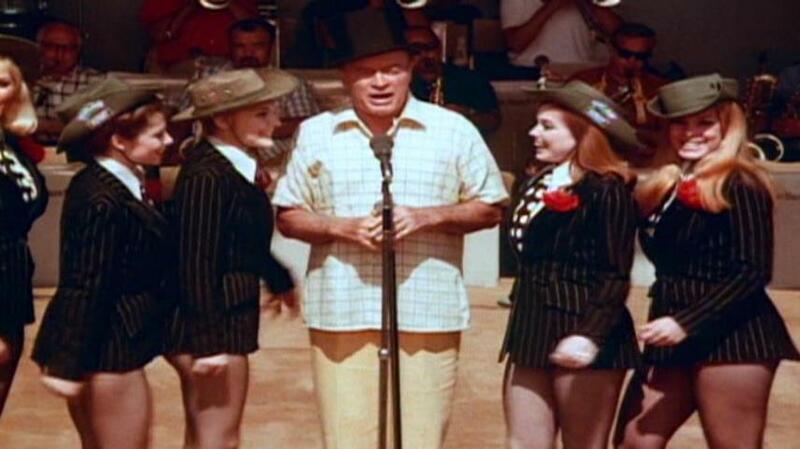 There will probably never be another entertainer like Bob Hope, who appealed to most of America and was generous enough to spend most of his holidays entertaining the homesick military. There's a great assortment of familiar and possibly forgotten guests here, although it's quite a let-down to have so many of the musical segments cut out and the Pointer Sisters reduced to mono. I'm thankful that at least Time-Life did not shy away from any of the "politically incorrect" humor however, as it should remain for historical sake no matter how offensive it might be. While not a perfect collection, this can't be rated anything lower than Recommended.